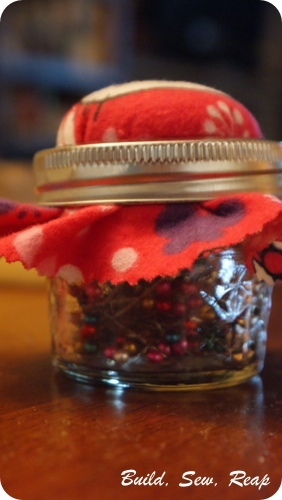 This is such a simple project but looks so cute. 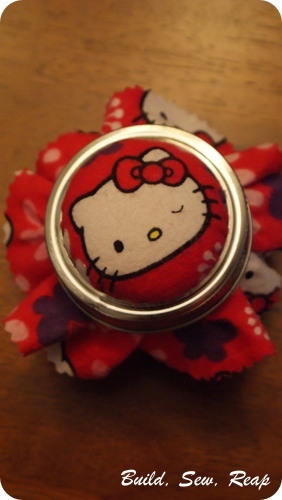 It's a pin cushion that also holds pins inside the jar. I didn't take pictures along the way but I'm pretty sure you can figure out on your own how this goes together. I'll give some quick pointers then show pictures of the final product. Start by cutting your foam or batting in a circle to fit over the disk of your 2-part jar lid. I glued mine down but you don't have to. Cut a piece of fabric to fit over that and leave enough to let it hang out. Put the disk with foam on top of the jar, place the fabric scrap over that and screw down the ring part of the 2-part lid. 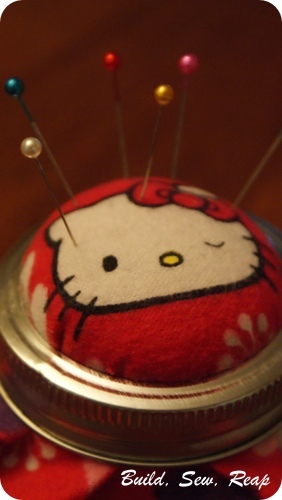 Optional: Squeeze some glue in to stick the fabric to the ring as well as to the disk. I just put a dab here and there to make the entire top portion stay together but be careful you don't put glue anywhere you'll want to stick pins or they won't stick well.